When I first moved to Suffolk, I was struck by these pleasant, sleepy villages of the upper Stour Valley. With their chocolate box village greens and half-timbered houses it was hard to believe that they were real, or that they had always been like this. It was only from John Appleby's Suffolk Summer that I got a different impression, reading about him arriving in these places by train, busy working villages in the year after the second world war, before the great retreat from the land. The railway has gone now, and prosperity has made them quaint. Stoke by Clare is not as spectacularly pretty as nearby Cavendish, but it still has its lovely green, some good pubs, and a church which is interesting; if hardly beautiful. 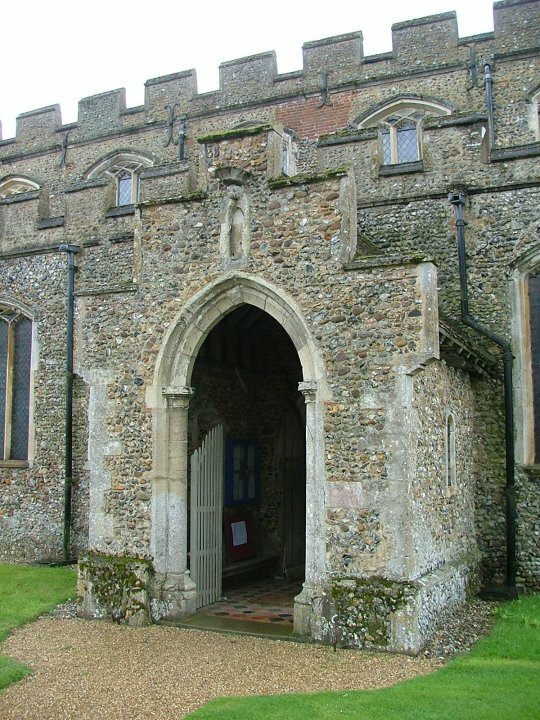 I had driven or cycled past the church many times, and stopped occasionally, always finding it open. I came back here with Aidan Semmens of Sylly Suffolk on Holy Thursday 2004, and as we pulled into the drive up to the church, the heavens opened. We waited, and then stepped out under a leaden, weeping sky. My first impression in this gloom was of quite how austere the castellated north side is, the aisle stretching beyond the high clerestory to the chancel east wall, as if this was a ship, and the nave roof the bridge. 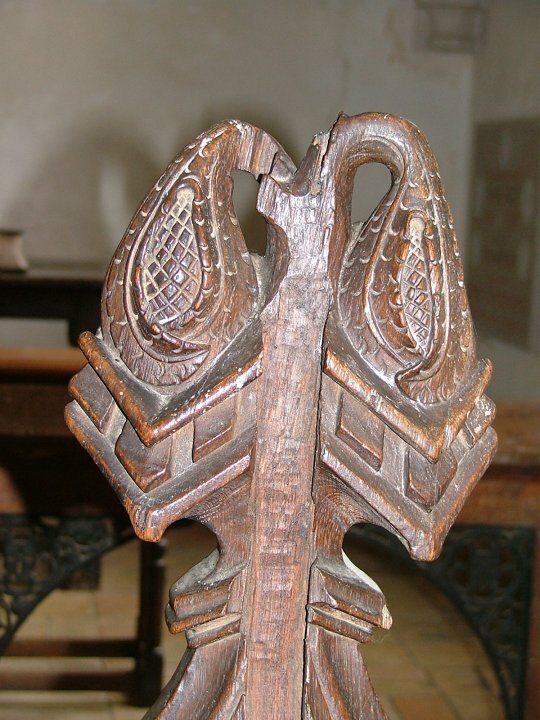 To complete the illusion, the rood turret has a little door leading out onto the aisle roof. This was all rebuilt in the later years of the 15th century, as you might expect, but they never got around to replacing the 14th century tower, which is off-set slightly to the south; for a good reason, as we shall see. The porch is also castellated, and I must confess I found it all a bit bleak, although Aidan pronounced it grand, which is probably fair. If Appleby found these villages hives of activity in the 1940s, think what they must have been like in the 1540s! For then, this was the industrial heartland of England. 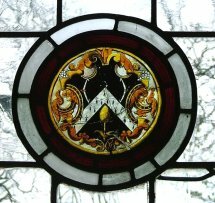 Stoke by Clare was home to a college of priests before the Reformation, Stoke College. This had formerly been a Benedictine Priory cell to the Abbey of Bec in Normandy, but like all alien cells became naturalised towards the end of the 14th century. Like many industrial places, Stoke by Clare was a hotbed of Protestantism by the early years of the 16th century. 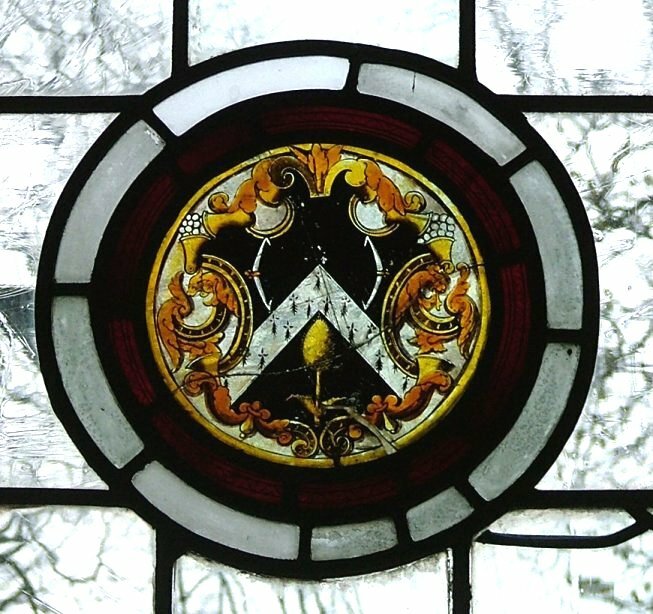 The Dean of the college was Matthew Parker; later, as an advisor to the brief but furious fundamentalist regime of Edward VI, and Archbishop of Canterbury under Elizabeth I, he was such a ruthless investigator and rooter out of Catholic practices, he earned the epithet 'nosy' Parker. For the moment, however, he was a major power-player in the struggle that would ultimately take England out of Europe. Parker's influence fell heavily on St John the Baptist, and it was one of the flagship preaching houses of the reformers. 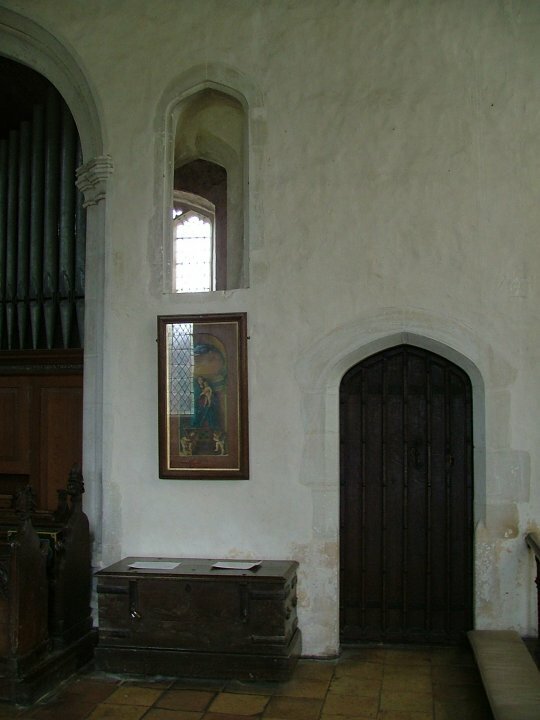 His pulpit is still in situ, a 15th century wineglass affair, barely 20" across inside. In Suffolk, I know only of Badley which is narrower. 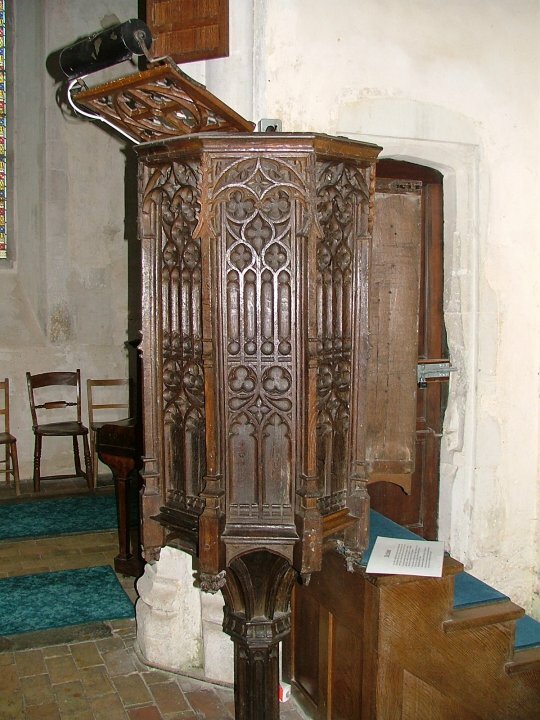 It reminds me very much of Latimer's pulpit at that other protestant flagship, St Edward, in Cambridge, a church that has retained its extreme tradition. One shouldn't really do these things, but I once stood in the pulpit there, and proclaimed, in Larkin's words, 'a few hectoring large-scale verses', and then stepped back to let 'the echoes snigger briefly'. The presence of other visitors here has always helped me resist the temptation to do the same thing. 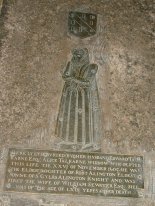 Stoke by Clare, not unreasonably, prefers to remember Parker for his role in translating the Bible and expediting Cranmer's prayerbook rather than for his reputation as an iconoclast. 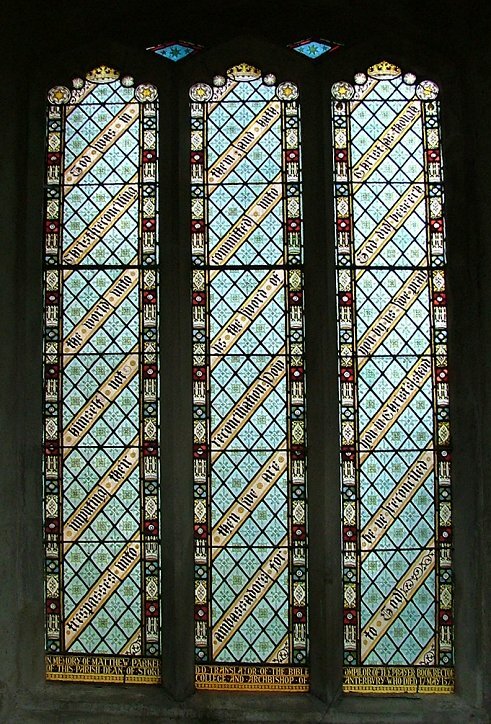 Some fairly mundane windows in the south aisle are a commemoration, and typical of the monuments Protestant Evangelicals erected in the late 19th century, as a way of countering the increasing influence of the Oxford Movement in the Church of England. Most famous of these, of course, is the Martyrs Memorial in Oxford. 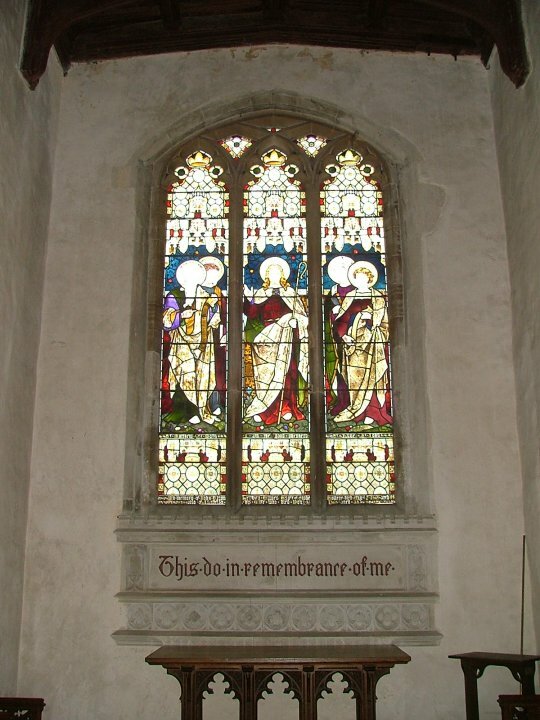 Other local memorials include that to puritan preacher Rowland Parker at Aldham Common near Hadleigh, the window to Foxe's Book of Martyrs printer John Daye at Little Bradley, and the ornate Protestant Martyrs memorial in Christchurch Park, Ipswich, which bizarrely quotes from the hymn For All The Saints, Who From Their Labours Rest. They were determined that the Movement would not simply sweep the Reformation under the carpet; and, as it has turned out, they have been proved correct. 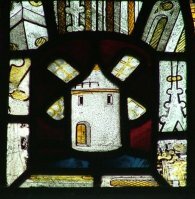 A curiousity of these windows, which are replicated in the north aisle, is that there is not a single picture or piece of figurative art in any of them. Ribbons of text wind dourly down the columns, and it would be a serious person who could bear to read them all. 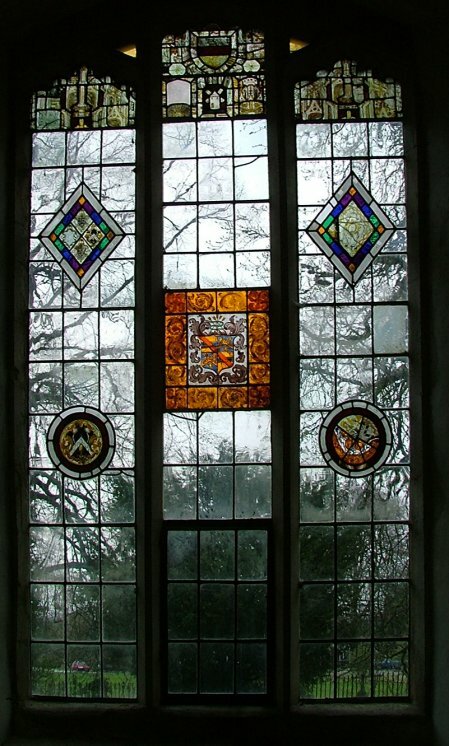 Perhaps the Parker memorial windows are preferable to the truly dreadful east window glass. Poor in quality, poor in design; Heaton, Butler and Bayne should be ashamed of themselves. Come friendly bombs, and rain on Stoke. 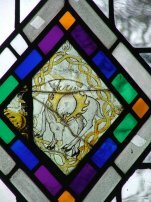 However, it isn't all bad news on the glass front, because there are some fascinating medieval survivals in the south transept. These include a post-mill, a stag caught in a thicket, and the arms of The Clothworkers' Company, who must have been very busy around these parts in the 15th and 16th centuries. 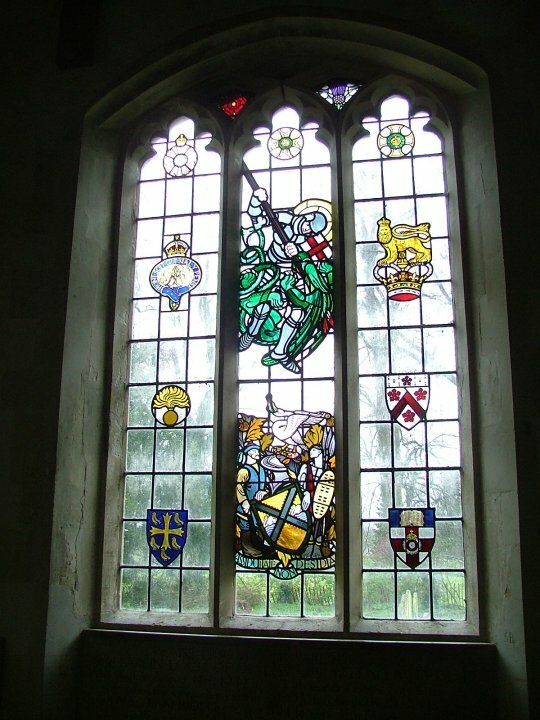 There is also a good modern war memorial window. 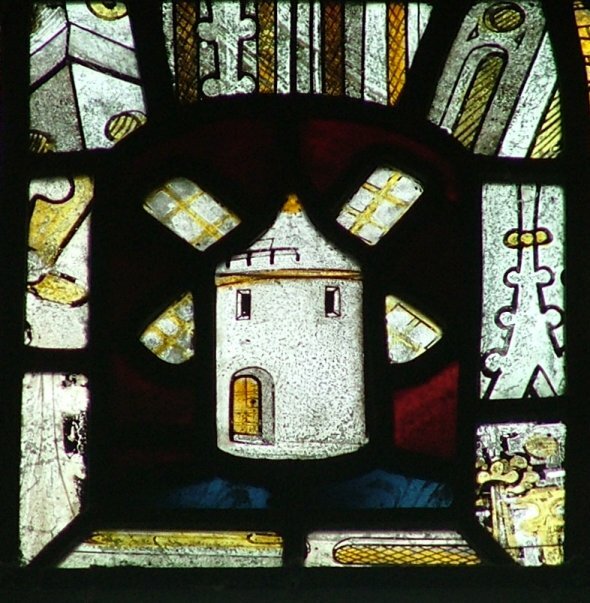 The medieval windows are below, the others in the left hand column. Hover over the images to read the captions, and click on them to enlarge them. Parker's uninspiring glass, and the abomination to the east, make this a gloomy interior, but this is balanced by the fact that it has brick floors, and is an unusual shape. If you look back towards the west, the filled-in tower arch is out of alignment, the south arcade finishing more or less in the middle of it. 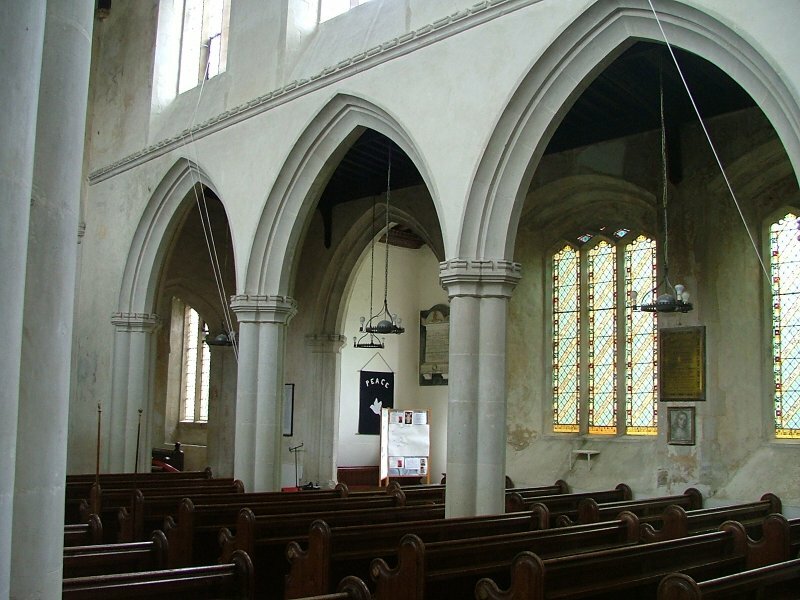 What has clearly happened is that the south aisle wall is the original south wall of a nave, retained for a new use when the new nave was built in the 15th century. 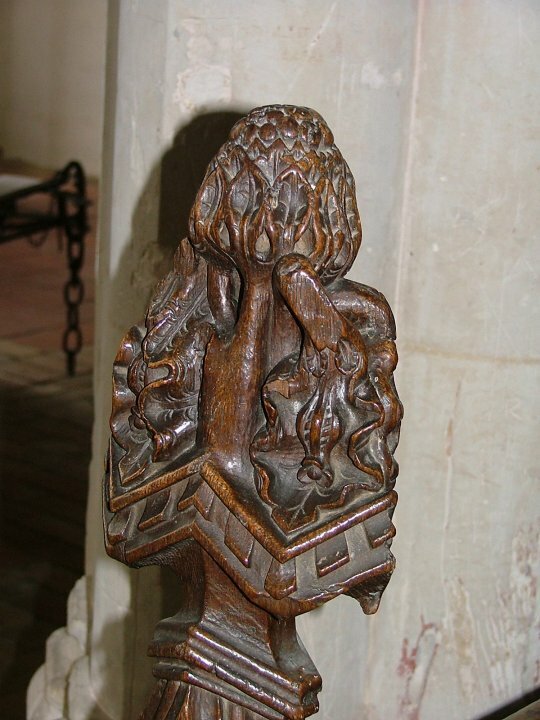 This may mean that the south chapel predates this; indeed, it is possible that the church was originall cruciform. 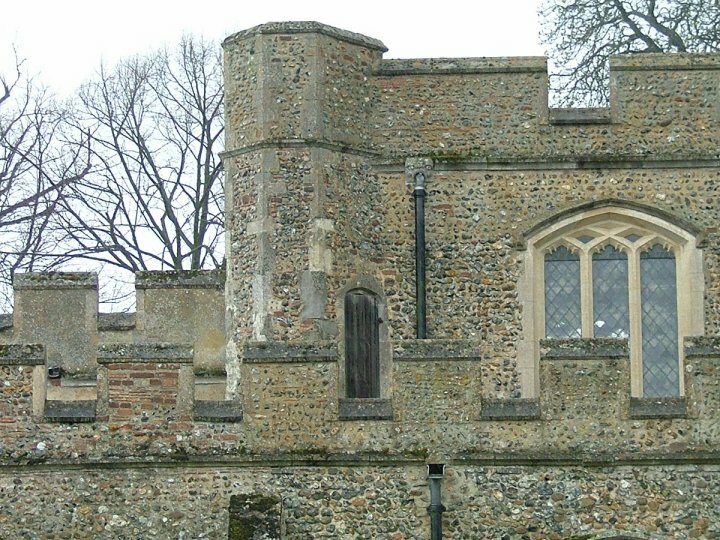 As the whole church was built northwards of the retained south wall, so the tower was left behind towards the south. To complicate matters further, we need to remember that some parts of the building were intended for use by the college of priests, and some for the people of the parish. 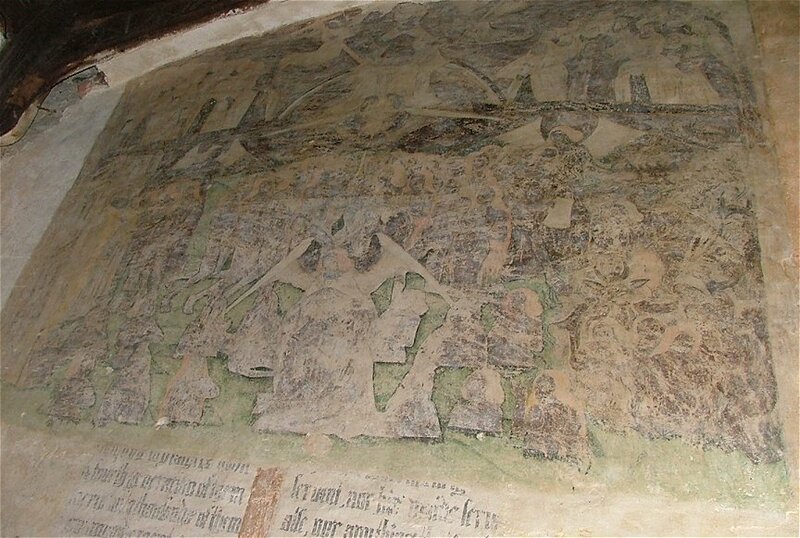 This explains the unusual position of a doom painting at the eastern end of the north aisle. 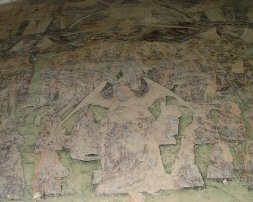 It was only uncovered in the 1940s, and is behind the organ; if you didn't know it was there, you might easily miss it. Because of the organ only five feet to the west of it, it is almost impossible to photograph. I have seen guides describing it as the work of the 1550s, during the Marian years, but I can think of no reason to believe this. Perhaps it has been presumed the work of the counter-reformers because the inscription that partly covers it is Elizabethan - the same is true at Wenhaston of course, where we know the doom is late 15th century. For me, the placing of the doom in the north aisle merely confirms the idea that the nave and chancel were still in the use of a Catholic college of priests, and I would date it as early 16th century at the latest. Its subject matter is conventional, but the colour sceme is unusual, with a pale green background. 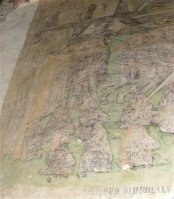 Christ sits in majesty on a rainbow at the top, as he does at Chelsworth, and below him St Michael stands, weighing souls in a balance. Around St Michael's feet the dead rise from their graves as at Stanningfield; the heavenly city is off to the left, while the fires of hell burn merrily on the right. 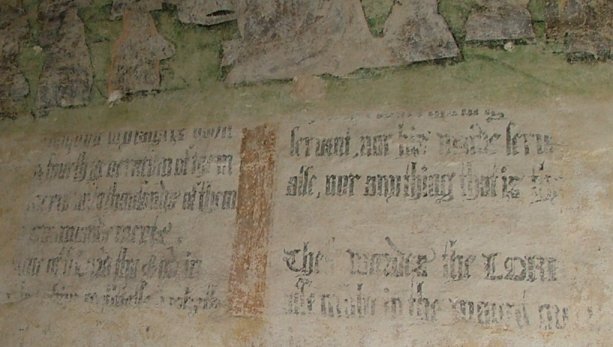 The inscription underneath was commonly placed in such a position by the reformers beneath a royal arms. Details of the doom are below; hover to read, click to enlarge. 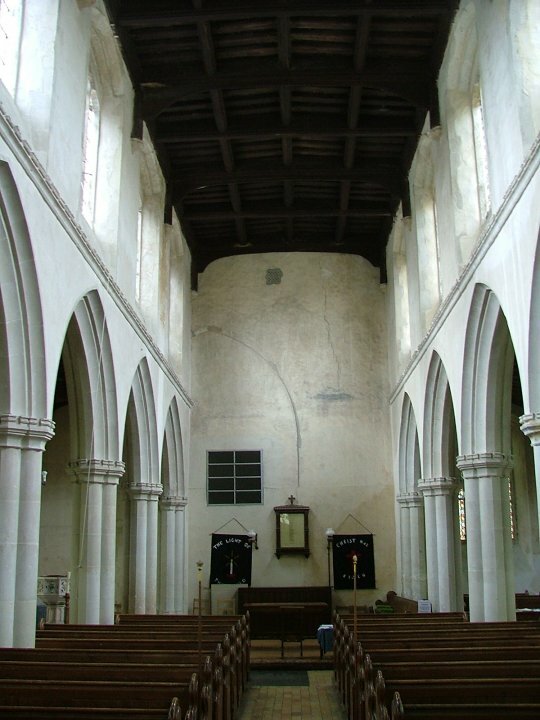 The whole of the interior is shot through with a sort of Puritan wilfulness; few Suffolk churches can be so accurately described as a shell as this one. That is not say that it is not the heart of a vibrant faith community; but little remains of its former liturgical integrity. And yet there are puzzles. 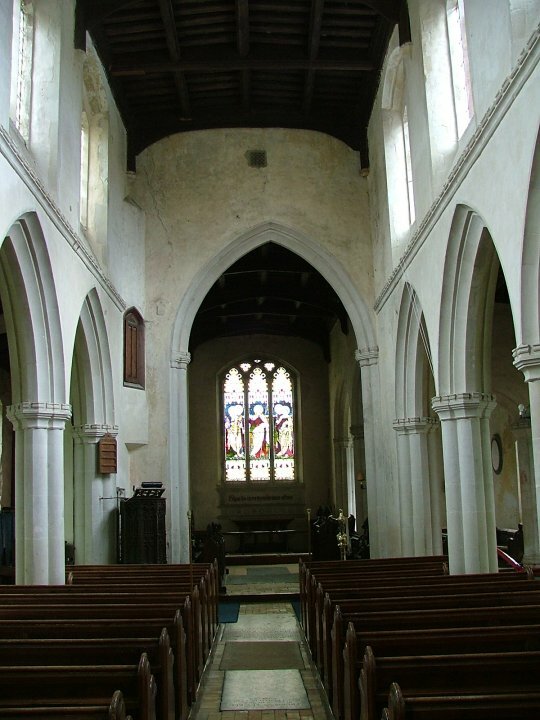 Standing in the chancel, look to the north. A doorway sits high up on the wall. 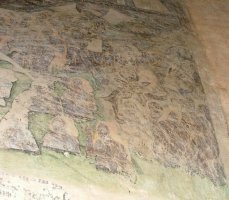 It cannot be for the roodloft, because we are some 20 feet east of the chancel arch here. On the north side of the doorway there are a couple of steps leading downwards, but they could not have continued, because they would have cut across the doom. Mortlock confesses that he can offer no reasonable explanation for it. 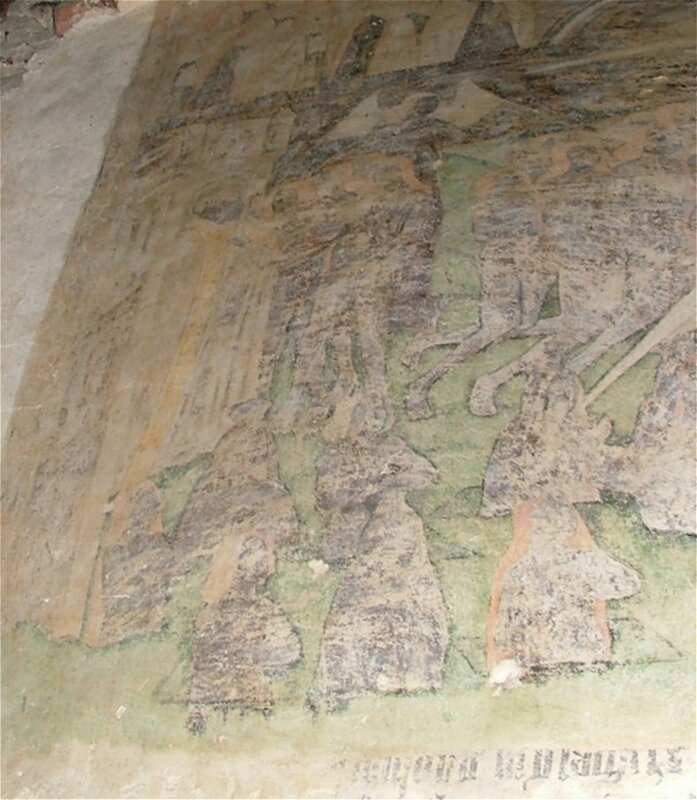 In the Little Guide, Dickinson suggests that the north wall of the chancel is, in fact, the retained outside wall of the north vestry of the original church, and that it had an upper room, which may do as an explanation if we accept it originally had an outside stairway. 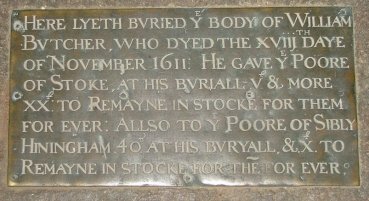 St John the Baptist has a good collection of brasses, and some of them are below. 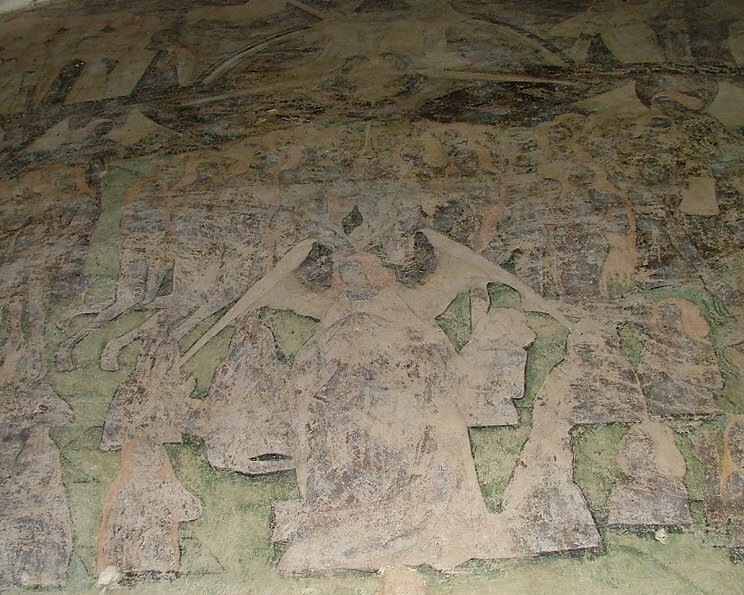 They are mostly at the eastern end of the nave, under carpets. 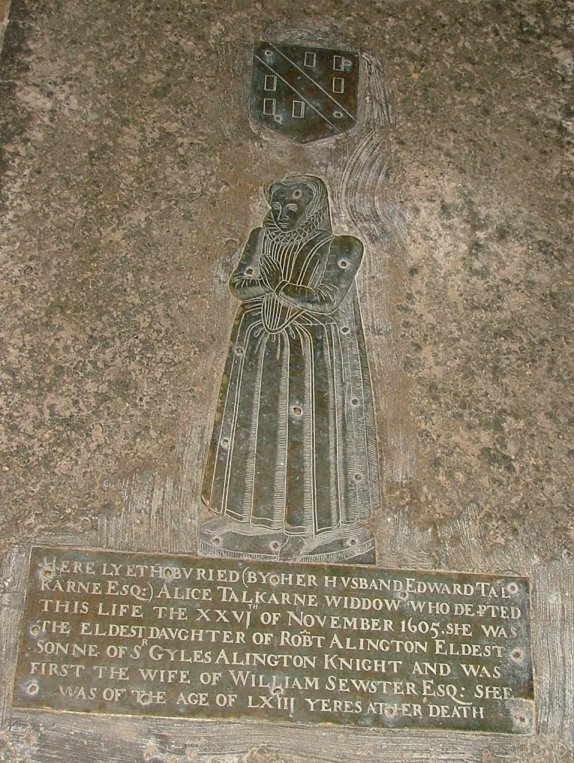 The famous ones are to Edward and Alice Talkerne, but all are interesting - you'll need to move the enormous brass lectern to see the best of them. Hover to read the captions, click to enlarge. Another curiosity is hidden away on a north side window sill - you'll have to go right around the organ works to find it. 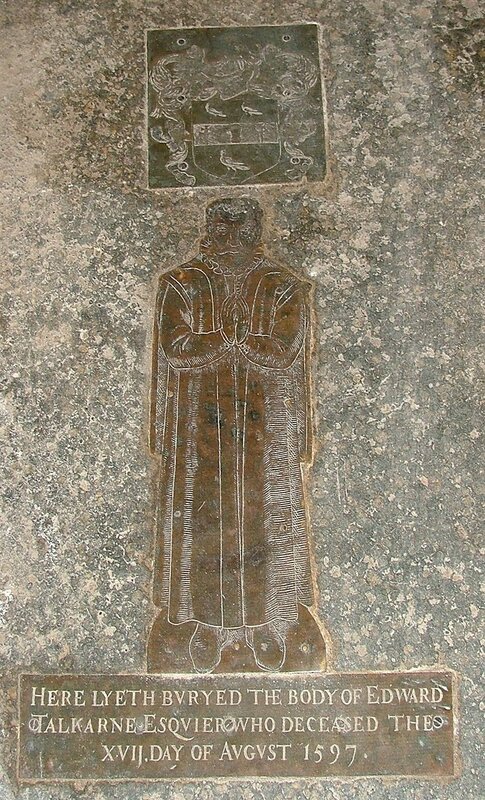 It is a primitively carved Latin memorial to a Priest, William Dickons dated 1567. 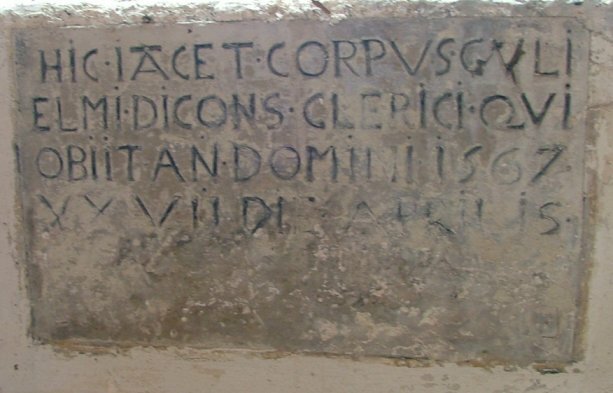 This is fully twenty years after the Reformation, but the bottom of the inscription appears to have been obliterated. 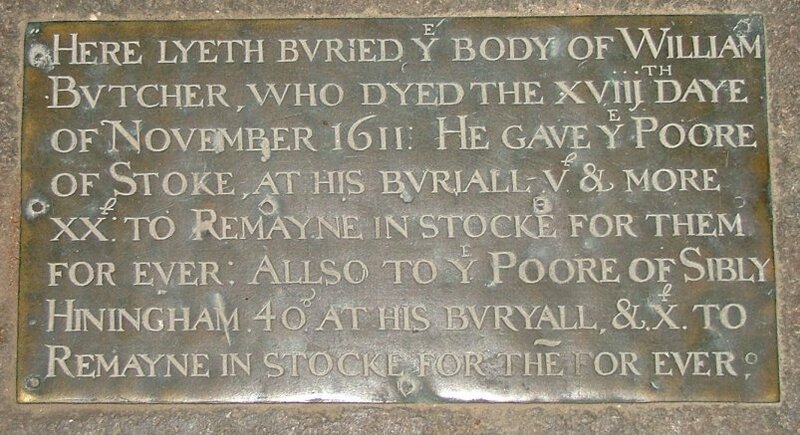 Was he one of the old college that had remained here, and died here? Was it placed here unofficially? 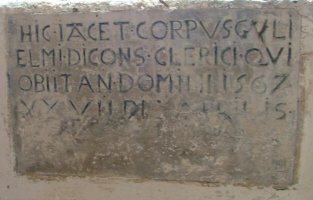 Did the lost inscription ask us to pray for his soul? 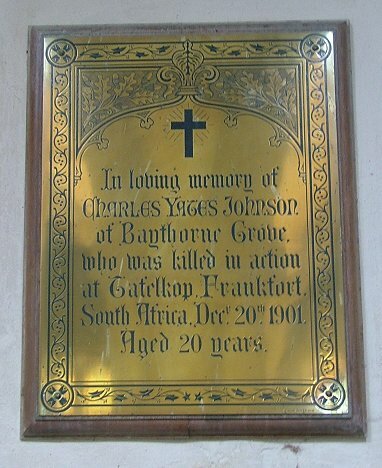 Whatever, it clashes harshly with the quality of the brass memorials. 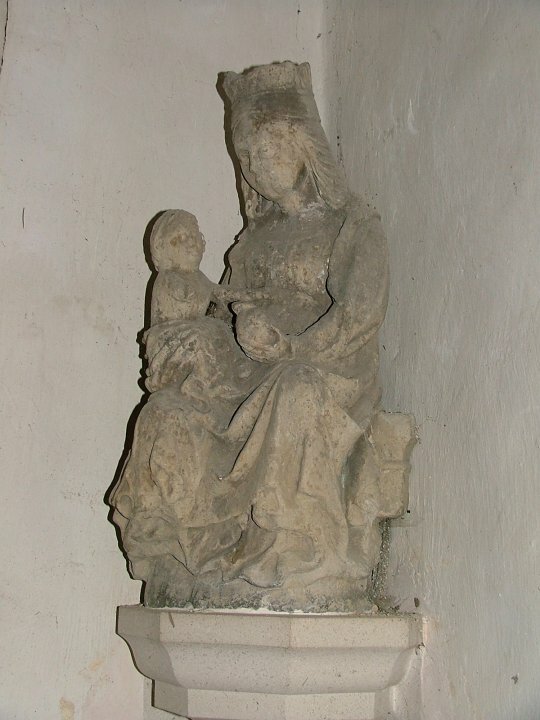 There is an interesting continental madonna and child, now set in cement in the corner of the sanctuary, and some beautiful bench end carvings - in keeping with this church, they are purely decorative, being seed heads and fruit in the main, although there is the remains of a dragon on one. Matthew Parker's muscular theology may be reflected in the clock bell, for which he was probably responsible; unusually for medieval bells, it doesn't bear an invocation to a saint, but the motto Surge Mane Servire Deo ('Rise in the Morning to Serve God'). These people went about their business with enthusiasm, and early-modern England was forged in their preaching. Just as 19th century non-conformism arose in the industrial north, so 16th century Protestantism first made itself known in these now sleepy villages. A warning to any Church which allies itself too strongly with the national status quo. 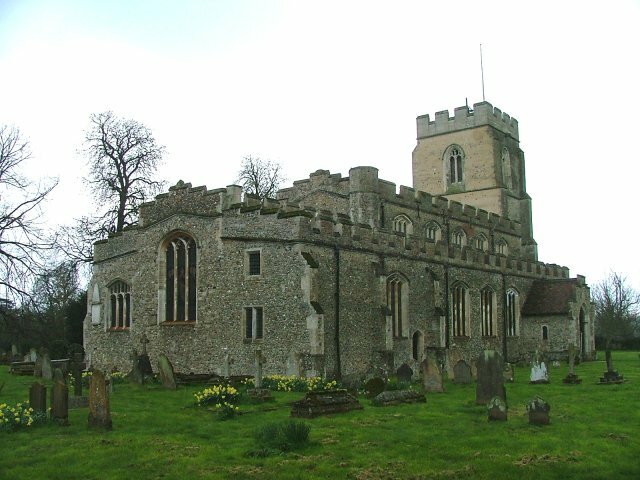 St John the Baptist, Stoke by Clare, is to be found on the A1092 Clare to Haverhill road. I've always found it open.